It’s been a busy couple of months here at CGC with a number of new additions to the CGC family as well as a continuing demand for high quality staff across all of our sectors. This month we welcomed Jamie Madden to our Brisbane office. Jamie is establishing our Business Support desk in QLD and has already had a successful start to her career with us. Anita McDermott has joined our trades and labour team here in Sydney. Finally, but not least, Prashilta Prahalad has joined the already established Business Support team in Sydney. Welcome, and we wish you all every success in your career with us! In this issue, Billy Versey offers an insight into the areas that are continuing to be busy in the building sector in NSW and Carmel Jones shares what we’ve been up to from a social perspective. NSW will see an extra $1.6b in funding bringing the total to $4.2b to be spent across 120 schools over 4 years. This is a massive injection of cash for the next generation of our ever growing population.. The money will be spent upgrading existing schools and building new schools to cater for an estimated 164,000 extra students by 2031. We will see a number of high rise schools being developed similar to the Arthur Phillip School in Parramatta, including Surry Hills & Newcastle. This is on top of large $50m to $100m school projects in Liverpool, North Sydney and the Shire to name a few. Another sector seeing an injection of cash is Health which is great news as we will see the Residential sector dwindle over the next few years keeping the NSW construction industry looking healthy (excuse the pun) for the foreseeable. With these two sectors ramping up and the residential industry at an all-time high we’ll see an already small talent pool shrink further. With this in mind we are encouraging our clients understand and take on candidates attraction and retentions solution to ensure the best talent is being landed and retained. If you want any information on attraction /retention solutions please contact your relevant consultant. It was a busy start to the Autumn at CGC with lots on the agenda. CGC have recently become a proud sponsor of WIDAC (woman in design and construction) and have attended two events so far this year. 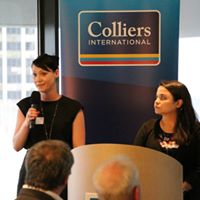 The first was on International Womens Day and focused on Press for Progress which was an interactive panel discussion with designers, builders and site based staff talking about the successes and challenges we face in construction. The second event, held on the 3rd May, was about Collaboration, focusing on the new Icare office fitout that has just been completed by Shape and DWP Architects. Whilst enjoying a bite to eat and a drink in the new Icare office we heard from the lead architects DWP, projects manager from Shape and quantity surveyor from WT partnerships on the challenges that were faced / overcome on the project. The CGC Wellbeing initiative is in full swing and in line with this quarter’s theme ‘Chill Out’, we had Sydney Laughter visit our office for a lunchtime Laughter Yoga session which gave us all a good belly laugh, and plenty of fake laughing too. All of it lifted our spirits and we look forward to the roaming desk massages next! Birthday wishes to Azri, Carmel, Will, Martin and Nick who all celebrated recently. The office was quiet for a week when the CGC backpackers went en masse to Bali, organised by the one and only William Gardiner who had to go via London to get his passport renewed… God help anyone who was planning a relaxing trip to Bali in May! Lastly, Happy CGC Anniversaries go to Carmel (2 yrs); Evan (6 yrs), Steve (5 yrs), Billy (5 yrs) and Christina (1yr). You are all integral to the CGC we’ve become. Congratulations!